Immigration New Zealand: Supporting new migrants to settle and work. Immigration New Zealand's settlement support activities. evaluation and reporting requirements for the Action Plan and for funded programmes. The Action Plan and the Auckland settlement action plan were approved in 2006. The Wellington settlement action plan was set up in 2008. After these action plans were set up, plans and governance structures have been updated and changed. Appendix 2 provides an overview of the main events related to settlement support throughout government since 2004. New Zealand's economic transformation is supported by the contributions of migrants and refugees and their ability to realise their personal aspirations by: accessing appropriate education and employment; utilising their skills, knowledge and qualifications. MBIE's 2012-15 Statement of Intent includes a relevant outcome that "the best people are brought to New Zealand" and an intermediate outcome that "migrants settle and work". The "Safe and Skilled Workplaces" work stream, led by MBIE within the Government's Business Growth Agenda, has a target that, "by 2016, 85% of skilled migrants will be employed in a job that matches their skills and qualifications". MBIE carries out its migrant settlement role through three main business units, as shown in Figure 3. Source: Adapted from Ministry of Business, Innovation and Employment Organisational Chart (November 2012). 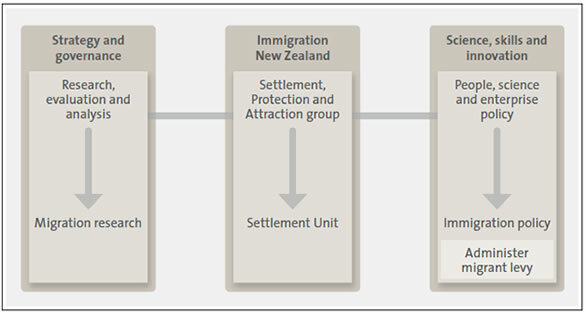 The Settlement Unit, within the Settlement, Protection and Attraction group of Immigration New Zealand, is the main business unit responsible for new migrant settlement. The Settlement Unit's 2012/13 business plan indicates that its role in leading the migrant settlement sector is based on the Settlement Strategy. The Settlement Unit, which is intended to contribute to the retention of high-value migrants and their families, works towards the objective of supporting migrants to settle and work so that they maximise their contribution to New Zealand. The Settlement Unit is not responsible for providing settlement services to help new migrants find work. Those types of settlement services are delivered by other agencies, as outlined in Figure 4 and Appendix 4. The Settlement Unit's work supporting new migrants to get suitable jobs is provided more indirectly through its role leading and co-ordinating national and regional settlement strategies. The Settlement Unit leads work within the Action Plan intended to overcome employment barriers that new migrants experience, as discussed in Part 5. Therefore, Immigration New Zealand's ability to lead, co-ordinate, and work in partnership with other agencies is important for achieving employment and economic outcomes. * The Tertiary Education Commission has a total of $21 million in its budget for community adult education including ESOL programmes that the Migrant Levy allocation adds on to for similar programmes. ** Annual funding for Settling In was reduced to $500,000 in 2013/14. helping employers to use and retain the skills and talents of new migrants. The Immigration Policy Group, part of MBIE's Science, Skills and Innovation group, administers applications from public entities for Migrant Levy funding (see paragraph 3.17) and the review processes for those applications. It also works on policy matters associated with new migrant settlement. The Migration Research, Evaluation and Analysis Team, located within the Strategy and Governance part of MBIE, is funded by the Migrant Levy. The Migration Research, Evaluation and Analysis Team carries out migration research, evaluation, and policy work. The Migration Research Programme is intended to contribute directly to ongoing service improvement and help the Government to respond to skill deficiencies. Because the structure for MBIE is relatively new, we cannot comment on how effectively the groups within MBIE work together. However, we consider that the Migration Research, Evaluation and Analysis Team and the Settlement Unit need to be more integrated than they have been. Integrating more would improve how Immigration New Zealand's evaluates and reports on how effective settlement services are. The Settlement Unit's latest business plan identifies this need. 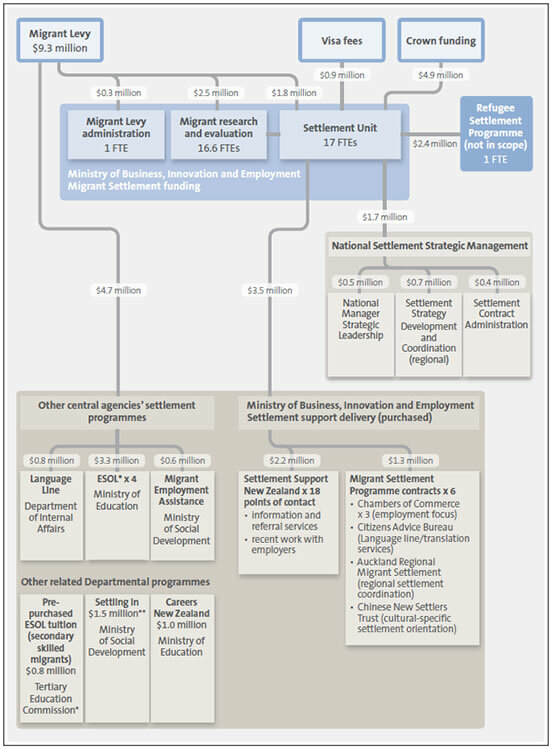 Figure 4 shows the complexity of the funding streams for the various activities and agencies involved in settlement support throughout government. Appendix 4 describes the various agencies, settlement support services, and programmes outlined in Figure 4.
research into settlement matters and the effects of immigration. In 2012/13, the Migrant Levy provided $6.5 million towards settlement support programmes throughout government. The programmes funded through the Migrant Levy have mostly remained the same since 2007. Appendix 5 shows how Migrant Levy funding has been allocated between 2008/09 and 2012/13 and how it is intended to be used. Several government agencies provide services to new migrants, and many service providers are contracted to government agencies, including service providers contracted through the Settlement Unit. It is a complex landscape, which is why the Government set up the Settlement Strategy to effectively co-ordinate the work and resources throughout government. Immigration New Zealand has been funded to lead and co-ordinate settlement support work since 2004. The Settlement Unit provides sector leadership to agencies and regions to support settlement responsiveness and maximise the contribution that migrants make to New Zealand. The Settlement Unit's 2012/13 budget was $7.6 million. The Settlement Unit comprises 18 full-time equivalent (FTE) positions. The Settlement Unit's budget includes allocations for leading and co-ordinating settlement support throughout government. These allocations are $0.7 million and seven FTEs for the settlement strategy, and $0.5 million and four FTEs for the national manager. A small proportion of the national manager budget ($40,000) is allocated for work on services for refugees and for operational management of the Settlement Unit. As outlined in Figure 4, the Settlement Unit's budget includes $2.4 million and one FTE for its refugee work. MBIE's Immigration Policy Group oversees the administration of the Migrant Levy and reports to the Minister of Immigration on how the Migrant Levy is used. Immigration Policy also has a role in providing advice to Cabinet on the Migrant Levy, making recommendations on who gets charged the Levy, how the funds are to be used, and assessment criteria for funding applications. Immigration Policy staff have administered the Migrant Levy in keeping with the process agreed by Cabinet in 2007, which specified that any remaining uncommitted revenue be held in a memorandum account. what Immigration New Zealand has said it would do to achieve the settlement objectives and outcomes it identifies in its statements of intent, business plans, and other public documents. Cabinet approvals for the national and regional settlement strategy emphasised that settlement leadership throughout government was more than collaboration and sharing information. Settlement leadership is intended to result in better use of resources and measurable and tangible improvements in settlement outcomes. Immigration New Zealand lacks the authority to direct other public entities in how to deliver settlement services or how to use funding provided for settlement support. Immigration New Zealand does have that authority for the settlement services that it purchases through contracts. Our audit work looked for evidence of effective Immigration New Zealand leadership aimed at achieving the objectives set out in the Settlement Strategy in collaboration with other public entities. In our view, leading settlement support throughout government to achieve the intended outcomes requires skills, capabilities, and processes to work with stakeholders in identifying the problems or barriers to achieving settlement outcomes, developing shared solutions, and steering a process to seek approval where needed to implement resolutions or changes needed. Immigration New Zealand's leading and co-ordinating role includes evaluating and reporting progress towards the objectives set out for the Settlement Strategy, the action plans, and its own settlement work. The Settlement Unit purchases and oversees national, regional, and local settlement services. Settlement Support New Zealand is an Immigration New Zealand initiative that provides a local point of contact for new migrants. Eighteen initiatives provide local settlement information and referrals that support settlement where migrants live. In 2011, Settlement Support New Zealand began working with employers and workplaces to increase awareness of the factors that increase the retention of migrants. Vote Immigration funds these services and the Settlement Unit budget for these services was $2.2 million in 2012/13. The Settlement Unit purchases core settlement services to help new migrants during their first two years in New Zealand. These services include contracts with Chambers of Commerce to support employers in recruiting and retaining migrant employees, and multilingual information and advice provided through the Citizens Advice Bureau. They are funded mainly by the Migrant Levy. In 2012/13, the Settlement Unit budget for these services was $1.3 million. The Migrant Levy fully funds the Migration Research, Evaluation and Analysis Team, which carries out a programme of research and evaluation on migrant settlement outcomes, with the aim of enhancing knowledge of, and influence decision-making about, immigration and settlement systems. The budget for this was $2.5 million in 2012/13. The Migration Research, Evaluation and Analysis Team is responsible for research and evaluation to help understand how well the immigration system is functioning in terms of settlement outcomes for migrants, their families, their employers, and society and the economy in general.